In 2007’s I Am Legend, Will Smith plays Robert Neville, apparently the lone human resident of New York City after its quarantine due to a viral plague. Neville hangs out with his faithful canine pal Sam and devotes most of his time to two activities: finding a cure for the infection and staying alive. When the illness spreads, it turns its victims into aggressive humanoid beasts. They can’t go out in the daylight, a factor that helps Neville, but he still finds survival to be a challenge. The movie follows his attempts to remain human long enough to fix this situation. Although nominally an action-adventure, Legend reminds me most of a seemingly very different movie: 2000’s Cast Away. The connection comes from their essential absence of actors. In both films, we occasionally see other performers, but the lion’s share of the screen time falls upon one person. Each effort becomes that actor’s to win or lose, so they can’t dog it or the flick will collapse. In the case of Cast Away, Tom Hanks offered a terrific performance that carried the long stretches of solo screen time. For Legend, Smith gets a little more assistance, as a dog offers better interaction than a volleyball, and those monsters create more of a visceral threat than Hanks’ chapped lips. Nonetheless, I think the flick demands a lot of Smith, so we shouldn’t underestimate his challenges. Smith rises to the occasion splendidly. It’s funny to think that both he and Hanks share similar acting roots, as they made their names on sitcoms. (Of course, Smith already attained fame as a musician, but his initial acting success came from The Fresh Prince of Bel Air.) I suppose that’s a coincidence, but it’s an interesting twist. Legend includes enough action beats to make it less of a stretch for Smith than Cast Away was for Hanks, but don’t view Legend as a slam-bang rollercoaster ride ala something like Transformers. 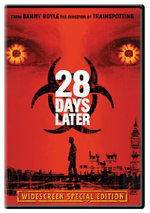 Long stretches of the movie depict Neville’s solitude and his day-to-day life. Some more adrenaline-pumping segments punctuate these, but you shouldn’t expect non-stop mayhem out of the Michael Bay playbook. Most of the film stays in a more reserved, low-key light that focuses on the Neville character and his situation. When I went into Cast Away, I worried that watching two hours of a guy stuck on an island would become a dreadful bore, but the film instead offered an entertaining experience. I entered Legend with higher expectations, as I didn’t know how sedate so much of it would be. After all, it came promoted as a blockbuster action film, not a laid-back view of one man’s daily routine. That makes the high entertainment value of Legend more impressive. At least I was prepared for a potentially dull experience with Cast Away, but with Legend I thought I’d get something more dynamic. Since I didn’t, I feel even more pleased at how interesting the flick is. Expectations can be a bear, and if you think you’ll get something action-packed and you don’t, the result might be even more boring. Legend confounds those expectations as it creates its own languid pace but keeps us interested. Again, much of the credit goes back to Smith. He creates such a rich, three-dimensional character in Neville that he can carry long stretches of the film on his back. Smith ignores any urges to go down a stoic 80s action hero path, so Neville isn’t a fearless quipster with an attitude. He’s a haunted man who struggles to right various wrongs. And battle vicious monsters, which makes things unusual. If I needed to find a flaw with Legend, I’d have to cite the surprisingly poor CG depiction of the plague victims. They look so cartoony and fake that I can’t quite figure out how they got past quality control. The infected monsters don’t take me out of the movie, but they do create unnecessary distractions. I Am Legend appears in an aspect ratio of approximately 2.35:1 on this Blu-ray Disc. This became a positive presentation. Overall sharpness looked good. Some interiors could show minor softness, but those instances remained inconsequential. No jagged edges or shimmering occurred and edge haloes appeared absent. Print flaws stayed non-existent as well. In terms of palette, much of Legend went with a lightly desaturated look. This changed for flashbacks, as those used more vivid and natural tones. Whatever the desired impression was, the film delivered clear and well-developed hues. Blacks appeared deep and firm, while shadows were smooth and nicely delineated. I found little about which to complain here, as the movie looked very good. Though not as active as most Dolby TrueHD 5.1 soundtracks to which I award an “A-“, I simply thought this mix was too strong to go with a lower grade. Given the lead character’s isolation, it used theatrics sparingly, as it usually preferred a quiet sense of environment. Those scenes weren’t dead, however; they created a good feeling of place and atmosphere. The whole thing packed a nice punch, too. Effects consistently sounded dynamic and vivacious. Quieter elements were natural and clear, while louder ones roared to life well. Music was similarly robust and full, while speech seemed distinctive and concise. Bass response proved particularly impressive throughout the film, as low-end showed tight, deep response. I enjoyed this track quite a lot. How did the Blu-ray compare to the DVD release? Audio showed more warmth and depth, while picture seemed more accurate and concise. The Blu-ray boasted the expected improvements. The disc includes both the film’s Theatrical Cut (1:40:31) as well as an Alternate Theatrical Version (1:43:54). Warning: potential spoilers ahead!!!. Skip the next four paragraphs if you don’t want to hear the differences between the two cuts and comparisons of their endings. I believe that the standard cut and the “Alternate Theatrical Version” are identical until approximately the 90-minute mark. In the edition fans saw on the big screen, Neville sacrificed himself to let Anna and Ethan escape with the cure for the virus. In the “ATV”, Neville realizes that the monsters have evolved to feel love. He gives back the chick on whom he’s performed tests to her “boyfriend” and the creatures allow Neville, Anna and Ethan to escape. The disc provides no information about who advocated the “ATV” and its ending, but if I had to guess, I’d think it was the studio’s idea. The conclusion of the “ATV” accomplishes two goals absent from the standard cut. For one, it’s clearly a happier finale since Neville lives, and for another, it creates the ability for us to get a sequel in which Smith appears. The ending of the “ATV” seems much more pat and silly than that of the regular theatrical cut. I maintain a little ambivalence about the standard version’s conclusion, but it beats this one. The interaction between Neville and the monsters gets goofy, and the happy ending feels trite and stale. The theatrical finish may not be as much of a crowd-pleaser, but it seems more natural and correct to me. Cautionary Tale: The Science of I Am Legend goes for 20 minutes, 41 seconds and features Lawrence, Goldsman, the CDC’s Julie L. Gerberding, Terrence Tumpey, TG Ksiazek and Paul Rota, the University of Texas Medical Branch’s CJ Peters, the Scripps Research Institute’s Dr. Michael BA Oldstone, UCLA Professor of Epidemiology Dr. Nathan Wolfe, Harvard Medical School’s Mary Elizabeth Wilson, UCSF Blood Systems Research Institute principal investigator Dr. Eric Delwart, National Institutes of Health’s Dr. Anthony Fauci, UCLA School of Public Health Dean Linda Rosenstock, University of Pittsburgh Graduate School of Public Health Dean Don Burke, The Coming Plague author Laurie Garrett and actor Will Smith. “Tale” takes a look at the facts behind the film’s fiction. It gets into details about research for the film and details of various viral infections. I don’t expect fairly serious examinations of scientific topics on a Blu-ray, but “Tale” works pretty well. Of course, a 20-minute featurette can’t become anything terribly deep, but it nonetheless offers an interesting discussion. For the 51-minute, 58-second Creating I Am Legend, we find a collection of 21 shorter clips. These include notes from Lawrence, Goldsman, Smith, stunt double Randolph LeRoi, 2nd unit director Vince Armstrong, novelist Richard Matheson, executive producer Michael Tadross, location manager Paul Kramer, trainer Darrell Foster, weapons specialist Samuel Glen, 1st AD Jeffrey “JP” Wetzel, animal coordinator Steve Berens, special effects coordinator Conrad V. Brink, Jr., and actors Charlie Tahan and Alice Braga. We learn about action and stunts, character/story topics and the project’s development, cast and performances, sets and locations, makeup and effects, military considerations and working with canine actors. The main problem with “Creating” comes from its disjointed nature. Since it compiles 21 small featurettes, it doesn’t spend a lot of time with any topic and it jumps from area to area pretty rapidly. Nonetheless, we still find plenty of good details here. Some of the material feels puffy, but a lot of interesting tidbits emerge along with many nice shots from the set. We discover four Animated Comics. These include “Death as a Gift” (3:03), “Isolation” (6:36), “Sacrificing the Few for the Many” (3:30) and “Shelter” (8:40). These live up to their description, as they offer slightly animated views of standard comic book panels accentuated with sound. They vary in effectiveness, as some are better than others; “Shelter” stands as probably the best of the bunch. All are reasonably interesting, though. 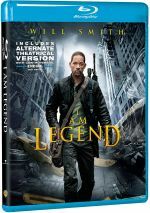 In I Am Legend, Will Smith produces arguably his finest theatrical performance, as his portrayal of a lonely, haunted plague survivor carries an entire film and makes Legend much more involving and intriguing than it should be. The rest of the flick has its ups and downs, but Smith is more than enough to make it consistently enjoyable. The Blu-ray offers strong picture and audio as well as a decent set of bonus materials. This turns into a quality release.